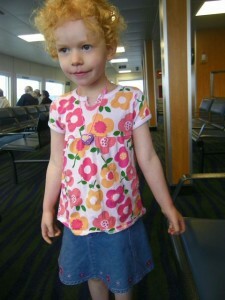 I can't believe that after five years and two children wearing this skirt, I only have one photo to show for it! It’s funny how clothes work. Sometimes you can spend a heap of money on an item of clothing thinking your child will love it forever and it never gets worn, or right after the first wear it gets ripped or gets a stain that refuses to come out. I remember my youngest, when she was two, took a pair of scissors to her brand new dress while she was wearing it! If you’re lucky, you might have a friend of a relative who gives you a box of hand me downs now and again. When the girls were small I got a bunch of hand me downs from my sister-in-law, but by the time my oldest was three or four she was the same size as her cousin who is three years older! Right now we have no hand me down friends, so needless to say, clothes are a lot more expensive than they used to be. For the most part I get their clothes at second hand shops. I like being able to save money while being environmentally friendly. Plus, it always gives me a great deal of satisfaction when I find a never-worn item at thrift store prices! At the back of my closet I have a box of sentimental clothes the girls wore when they were babies and toddlers. Some of them are hand knit items from friends and family, others are the prettiest frocks they wore; there is the dress our daughter wore, only once, at our wedding when she was seven months old, and a few items are clothes they wore all. the. time. The clothes that never died. No matter how stained or stretched out, they wore them until they could no longer squeeze their little bodies into them. For some reason those clothes are my favourite, and I imagine once my daughter can no longer fit into her size 3 jean skirt, I will add it to the box too. Do your kids have any clothes that have lasted way longer than you expected? My two year old daughter isn’t too hard on her clothes, thankfully, although we get 90% (everything other than gifts from family) from Goodwill anyway. She typically wears lots of dresses, and this summer I’ve been reusing all her summer dresses from last year as tops over shorts. My sister handed me down clothes when Baby T was born. I had one box for every month until about 12 months. Then things got sparse. I couldn’t understand why until I dealt with my own toddler. Every shirt gets stained every day, there are potty accidents and mud accidents and grass accidents, and it’s hard to keep anything in good shape. I let him wear it, but I certainly can’t hand it down afterward!